Over 300,000 Views since 2008 - Reflections BISHOP HARRIS DS KELLY IKE WALKER BILL CARVER DENNIS CARTER Running Backs Line Coach Receiver Defense Head Coach E.E. 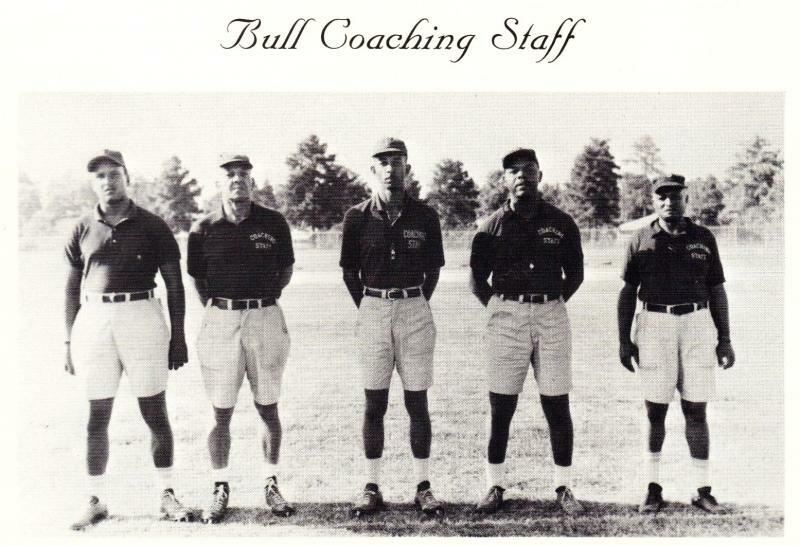 SMITH HIGH SCHOOL LEGENDARY COACHES....THE DEFINITION OF GREATNESS COACHING STAFF OF THE 1967 4A STATE CHAMPIONS THE WINNINGNESS HIGH SCHOOL BASKETBALL COACH IN NORTH CAROLINA HISTORY Harvey Reid, Jr. High school coach. Record of 816-208 in 42 seasons at Academy Heights (Pinehurst) Frederick Douglas (Elm City), Elm City, and Wilson Fike. Won seven state titles and 20 conference championships. Won 69 consecutive games, 1961–1963. Winner of numerous state and conference coaching awards. Member N.C. High School Athletic Association Hall of Fame. Graduated Johnson C. Smith, 1949. Born 1926, Fayetteville. Died 1991 while coaching a play-off game in Fayetteville. COACH DAVID HOLLINGSWORTH Wife: Gwendolyn Hollingsworth David was born in Fayetteville, North Carolina and raised in Brooklyn, New York. He moved to Flint in 1968 and was hired by the Beecher School District. David's first job was a teacher at Marion Harrow Elementary School. Dave went from elementary to Dolan Jr. High as a science and physical education teacher, along with coaching ninth-grade football and basketball. In 1974 Dave transferred to Beecher High School and assisted the varsity football team as quarterback coach from 1974 to 1976. He also coached the boys junior varsity basketball team and was assistant varsity basketball coach under Mike Bedore and Mose Lacy. In 1974, David became the girls varsity basketball coach, leading the Lady Bucs to 13 consecutive Big Nine Conference championships and 13 consecutive district titles. He had a 35 consecutive games winning streak in the conference and won two state championships.Between 1980 and 1987 David was named Big Nine Coach of the Year five times and Class B Coach of the Year three times. David is retired and lives with his wife in Beaufort, North Carolina. David L. Hollingsworth, 73, of Beaufort, died Sunday, Jan. 27, 2013, at home. High school coach. Record of 816-208 in 42 seasons at Academy Heights (Pinehurst) Frederick Douglas (Elm City), Elm City, and Wilson Fike. Won seven state titles and 20 conference championships. Won 69 consecutive games, 1961–1963. Winner of numerous state and conference coaching awards. Member N.C. High School Athletic Association Hall of Fame. Graduated Johnson C. Smith, 1949. Born 1926, Fayetteville. Died 1991 while coaching a play-off game in Fayetteville. David was born in Fayetteville, North Carolina and raised in Brooklyn, New York. He moved to Flint in 1968 and was hired by the Beecher School District. David's first job was a teacher at Marion Harrow Elementary School. Dave went from elementary to Dolan Jr. High as a science and physical education teacher, along with coaching ninth-grade football and basketball. In 1974 Dave transferred to Beecher High School and assisted the varsity football team as quarterback coach from 1974 to 1976. He also coached the boys junior varsity basketball team and was assistant varsity basketball coach under Mike Bedore and Mose Lacy. 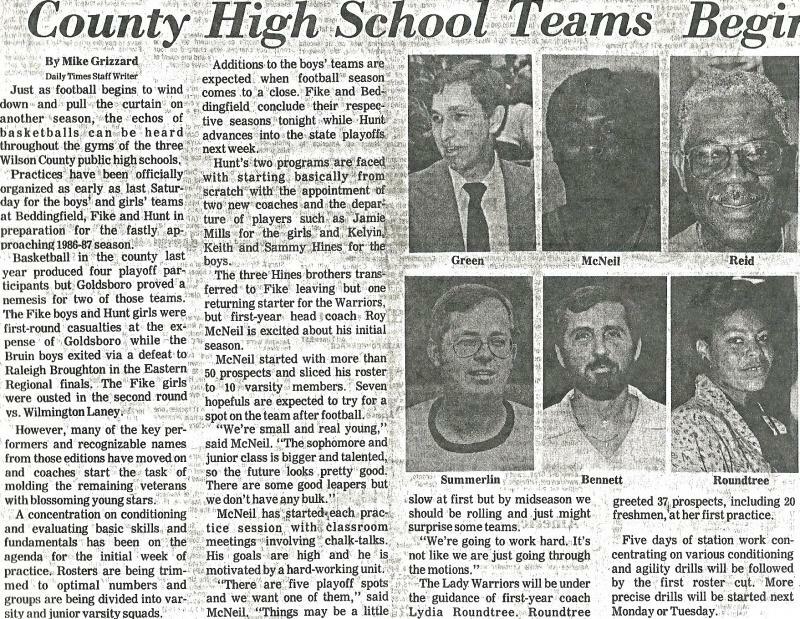 In 1974, David became the girls varsity basketball coach, leading the Lady Bucs to 13 consecutive Big Nine Conference championships and 13 consecutive district titles. He had a 35 consecutive games winning streak in the conference and won two state championships. Between 1980 and 1987 David was named Big Nine Coach of the Year five times and Class B Coach of the Year three times. David is retired and lives with his wife in Beaufort, North Carolina. David L. Hollingsworth, 73, of Beaufort, died Sunday, Jan. 27, 2013, at home.